Whether you’re a practiced Paleo cook, or just starting your journey into the Paleo lifestyle, you know how gratifying preparing home-cooked Paleo meals from scratch can be. You’ve probably also experienced how much time it can take shopping for wholesome, all natural ingredients and cooking meals from scratch. If you’re like us, you’re familiar with the struggle of finding time to devote to food prep – especially when life gets hectic. If you’re looking for help maintaining your Paleo lifestyle in life’s busier moments, then you’ve come to the right place. Whether a meeting has run late and you’re looking to order-in a last-minute dinner, or if you’re in search of a more sustained solution for a busy week ahead, we’ve got you covered. There are tons of local restaurants and national companies that will deliver Paleo meals, cooked from scratch, straight to your door. Below, we’ve compiled lists of local and national companies who tailor grain, dairy, and sugar-free Paleo meals to customers in the Oklahoma City area. Read on to learn more. 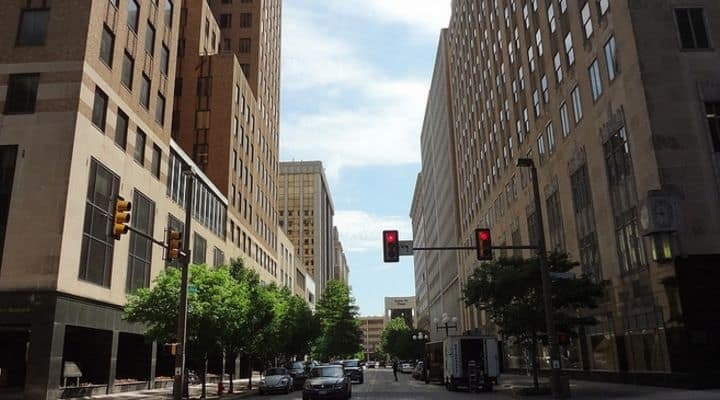 Oklahoma City has a great local food scene, complete with tons of restaurants serving everything from southern classics to globally inspired cuisine. However, if you are on the Paleo Diet, your options for local restaurants are often more limited, especially if you are keeping strictly on the diet. In the next two sections we list out companies that offer gluten free, grain free food delivery, an option that allows for something similar to take-out but also sticking within Paleo guidelines. 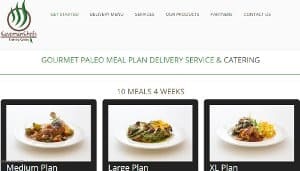 Although Paleo options are limited in the Oklahoma City area, in the following section we’ve listed local options for Paleo practitioners to order grain, dairy, and sugar-free meals. These chef services don’t necessarily cater exclusively to Paleo clients, however they do offer options to fit your specific dietary needs upon request. If you’re interested in supporting your local community, and want a break from the kitchen, these places are likely worth a try. 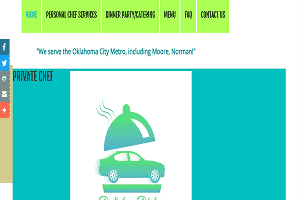 Delishes Dishes, is run by a personal chef, Chef Daphne, who works with individual and corporate clients in the Oklahoma City area. She specifically lists that she works with people on the Paleo diet, as well as individuals with other dietary restrictions such as needed a gluten free diet (they have a whole gluten free menu), have IBS, are on the ABS diet, weight watchers, etc – they cater to a lot of dietary restrictions. Meals are prepared in bulk in your home kitchen (as opposed to the true meal delivery services covered later in this article), but are packaged up in containers and stored either in the refrigerator and/or the freezer so that you have meals available for the rest of the week and month. You are given an initial consultation where you go over any dietary restrictions, and a date is scheduled for them to come out to your home and cook the meals. Prices include shopping for and cooking the meals, but ingredients are paid for separately – you can request your favorite grocery store for the shopping. Unlike many of their local counterparts, these companies offer meal delivery services exclusively to Paleo customers and deliver to anyone in and around Oklahoma City. These companies craft their menus using grass fed and pastured proteins, local in-season and organic produce, and high quality oils, fats, and broths. Ordering from a national company, you can be absolutely certain that your meals are created with fresh, organic ingredients that adhere to Paleo principles. If you’re traveling out of town soon, if you have exams coming up, or if you’re not the biggest fan of cooking, you may want to plan in advance and order from a national company. These companies ship meals, either frozen or fresh, express and straight to your door anywhere in Oklahoma City and the greater area. Most of these companies also offer specific Paleo meal plans, accommodating clients who follow the Autoimmune Paleo protocol, Wahls Paleo, or thirty-day detoxes. If you’re interested in a more sustained solution to meal-prep and cooking, give any one of these companies a try! Whether you’re looking for a month’s worth of meals, or just a few a la carte selections, Paleo on the Go has an option for you. The company delivers throughout Oklahoma, and is a popular one that has been well reviewed by bloggers and Paleo centered organization. It offers a few different meal plans (including an AIP plan and a 30-day elimination plan), as well as a variety of interesting menu options for breakfast, lunch, and dinner. They also offer bone broths and Paleo bacon and sausage from Penderson farms (in Texas). If you’re interested in knowing where your food comes from, Paleo on the Go has a page that lists and links to all of their vendors, so you can be sure your food is created from organic ingredients if on the dirty dozen or are on the clean fifteen ingredients lists. See paleoonthego.com for prices and meal options. For our detailed write up on Paleo on the Go including reviews, see our in-depth coverage on them. 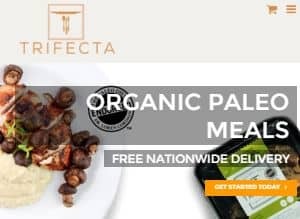 Trifecta’s meals appeal to those looking to support their fitness goals and offers Paleo, Clean eating, vegetarian, or vegan meal plans. The company prides itself on using 100% organic produce and humanely raised proteins. They advertise to customers looking to supplement an active lifestyle with clean, healthy food, and so their menu options are simple and straightforward. Their meals are gluten, dairy, and soy free as well as non GMO. For those who are looking for a bit more portion control, Trifecta offers you an option to order food a la carte and in bulk. Best of all? They ship free to Oklahoma City. See trifectanutrition.com for current prices for their Paleo and organic meal delivery Oklahoma City offerings. The Good Kitchen is currently offering an introductory discount for first time buyers: three free meals plus an order of bone broth with your purchase of a meal plan. The company doesn’t have a la carte options and requires that customers purchase a meal plan, but it has many menus from which customers can order and create their plans. 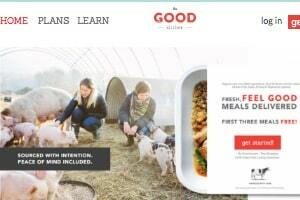 The North Carolina-based Good Kitchen also offers customers the opportunity to change the frequency of their orders. They create all their meals using organic produce, grass fed beef, and free range chicken, with no added sugars. Like Trifecta, they also offer free shipping. See thegoodkitchen.com for The Good Kitchens complete menu and list of healthy meals delivered Oklahoma City / nationwide plans. For our detailed write up on The Good Kitchen including reviews, see our in-depth coverage on them. For customers looking to lose weight on their Paleo diet, Eatology is a great place to order from. Eatology is another company with a rotating weekly menu and their Paleo meals follow the Zone protocols (which count macronutrients to help with weight loss). They portion control their meals by using “blocks” and you can order a medium, 2 block meal or a large, 3 block meal. They also offer a party platter, which contains 12 blocks and can feed between 4-6 people. Eatology’s portioned-controlled meals make their service one of the most affordable options on this list. They have a series of meal plan options to choose from and offer monthly discounts as well as 10% off for first-time customers. See http://www.eatology.co for Eatology’s Paleo-zone plans and pricing, including nationwide plans for healthy meal delivery Oklahoma City options. Pre-made Paleo is known for their Whole30 compliant meals and meal plans. They offer AIP and sugar-free meals plans as well as an option to order pork-free meals. The popular delivery service offers a constantly rotating list of specialty items like alpaca, venison, and wild boar Andouille sausage. Pre-Made Paleo also offers a variety of add-ons. Along with your meals you can order spice mixes, rendered fats, snack bars, even pork rinds (hog skins). While the company used to only ship frozen meals, they’ve recently added on an option for fresh meal delivery as well. For our detailed write up on Pre Made Paleo including reviews, see our in-depth coverage on them. 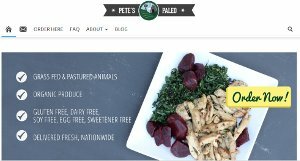 Pete’s Paleo keeps close ties to local vendors, sourcing only organic produce and grass fed, pastured meat. If you’re looking for variety, the company has a frequently changing menu based entirely on availability of local, seasonal ingredients. The company has been featured in many newspaper and magazines and on several TV programs, and is especially known for their sugar-free detox plan. They’re also the only company on the list to offer a Wahls Paleo plan (for people suffering from chronic illnesses). Pete’s has a few add-ons available to customers, including a line of house-made, sugar-free bacon. Most of their orders ship free and straight to your door. See petespaleo.com for a complete list of prices, meal plans and healthy food delivery Oklahoma City options. Caveman Chefs is owned and operated by a group of restaurant professional with years of experience in the restaurant and catering industry. The company is based in Denver, Colorado and sources its ingredients from local farms and vendors. To make their meals, Caveman Chefs use organic produce, grass fed meats, and wild-caught fish. Their meals are priced by size and you’ve the option to choose from medium, large, and extra-large meals. While their meal-plan options are limited, their food is creative and customizable. They are one of the few companies that allow you to dictate dietary restrictions as well as your likes and dislikes. For our detailed write up on Caveman Chefs including reviews, see our in-depth coverage on them. We hope this article has provided you with a multitude of Paleo friendly options for meal-delivery available in the Oklahoma City area. Between the great local restaurants and the variety of national companies and meal options, there is no shortage of solutions for those nights of the week when you just can’t cook Paleo. Even if you love cooking, and can usually find the time to cook, there are tons of great reasons to order pre-made meals. Ordering locally helps support and sustain Oklahoma City’s burgeoning food scene. If you order nationally, you can access wholesome, natural ingredients from Florida, Colorado, North Carolina – places whose local produce might otherwise be difficult to obtain. Ordering an occasional meal can make a real difference in your ability to sustain your Paleo lifestyle. Keep in mind that, if you’re travelling out of town, these delivery services make it easy to maintain your diet. Many national companies ship their food in travel-conducive packaging, or, if you are interested in supporting the local economy, you can check out our other articles on local options for eating Paleo. Hopefully with all these options for meal delivery, you’ll find something you enjoy! If you have any suggestions of other places offering Oklahoma City Paleo Friendly Meal Delivery or know of Oklahoma City Paleo restaurants that might offer takeout or delivery options, please let us know in the comments below.